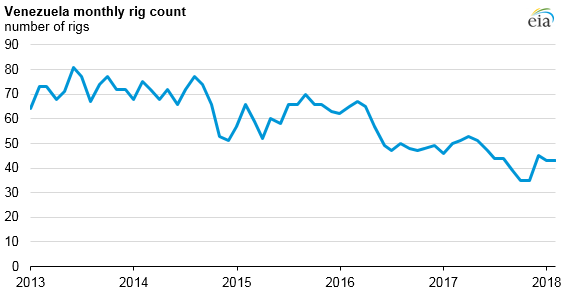 Venezuela’s crude oil production has been on a downward trend for two decades, but it has experienced significant decreases over the past two years. Crude oil production in Venezuela decreased from 2.3 million barrels per day (b/d) in Jan. 2016 to 1.6 million b/d in Jan. 2018, according to the U.S. Energy Information Administration. A combination of relatively low global crude oil prices and the mismanagement of Venezuela’s oil industry has led to these accelerated declines in production. Several factors indicate that Venezuela’s crude oil production will likely continue to decline. The number of active rigs has fallen from near 70 in the first quarter of 2016 to an average of 43 in the last quarter of 2017. Recent reports indicate that missed payments to oil service companies, a lack of working upgraders, a lack of knowledgeable managers and workers, and declines in oil industry capital expenditures have also contributed to production declines. Venezuela produces extra-heavy crude oil in the Orincoco Oil Belt area and relies on imports of lighter liquids (diluents) to blend with this crude oil to make it marketable. Financial difficulties recently have occasionally prevented the state-owned oil company, Petroleos de Venezuela SA (PdVSA), from importing the necessary volumes of diluent to sustain production and exports. In EIA’s Short-Term Energy Outlook, Venezuela’s crude oil production will continue to fall through at least the end of 2019. Crude oil production losses are increasingly widespread and affecting joint ventures. With the reduced capital expenditures, foreign partners are reducing activities in the oil sector. Venezuela’s economy is heavily dependent on the oil industry, and production declines result in reduced oil export revenues. Venezuela’s economy contracted by nearly 9% in 2017, based on estimates from Oxford Economics. EIA reports on and differentiates between outages and expected declines in production. In general, EIA classifies unplanned shut-ins as any production outages that occur as a result of sudden and unexpected events. These events include, but are not limited to, armed conflict, labor actions, natural disasters, unplanned maintenance, or sanctions. Effectively, outages represent unforeseen and temporary disruptions, but Venezuela’s crude oil production decline has been largely anticipated and may be longer lasting. For example, the unplanned shutdown of the Forties pipeline in the United Kingdom in Dec. 2017 was considered as an unplanned outage, as were the outages that resulted from wildfires in Alberta, Canada, in the summer of 2016 and the frequent outages in Nigeria, where militants have targeted oil infrastructure. In contrast, EIA considers production declines in Venezuela to be an expected decline—the production declines have been forecasted by EIA for some time. As a result, EIA’s Short-Term Energy Outlook estimates of historical unplanned production outages among the Organization of the Petroleum Exporting Countries (OPEC) do not include OPEC-member Venezuela’s production declines.